This original painting is currently available for purchase. For more information please contact us. Zorba the Greek (Greek: Αλέξης Ζορμπάς, Alexis Zorba(s)) is a 1964 British-Greek drama film directed by Cypriot Michael Cacoyannis and starring Anthony Quinn as the title character. 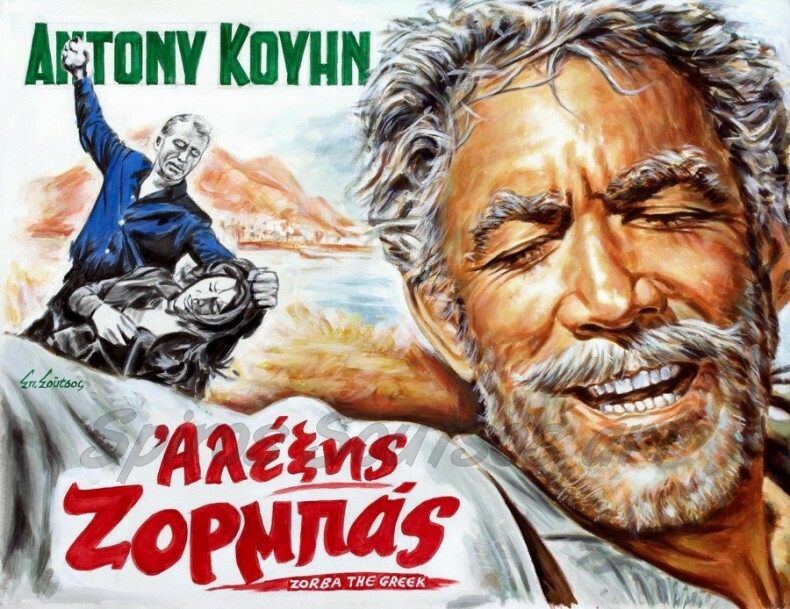 It is based on the novel Zorba the Greek by Nikos Kazantzakis. The character of Alexis Zorba (Αλέξης Ζορμπάς), is a fictionalized version of the mine worker, George Zorbas (Γιώργης Ζορμπάς 1867–1942). The supporting cast includes Alan Bates, Lila Kedrova, Irene Papas, George Foundas and Sotiris Moustakas. Simone Signoret began filming the role of Madame Hortense but Lila Kedrova replaced her early in the production and earned the Academy Award for Best Supporting Actress. The film was shot on location on the Greek island of Crete. Specific locations featured include the town of Chania, the Apokoronas region and the Akrotiri peninsula. The famed scene in which Quinn’s character dances the Sirtaki was filmed on the beach of the village of Stavros. The film was a smash-hit. Produced on a budget of only $783,000, it grossed $9 million at the U.S. box office. At the worldwide box office, the film earned $9.4 million in rentals, placing the worldwide gross between $18.8 million to $23.5 million. It was the 19th highest grossing film of 1964. The dance at the end of the film, choreographed by Giorgos Provias, formerly known as “Zorba’s dance” and later called Sirtaki, has become a popular cliché of Greek dance. The film’s music by Mikis Theodorakis, especially the main song, Zorbas, is well known in popular culture.